Big Data is at the centre of the technological revolution affecting businesses and business environments, including artificial intelligence, machine learning and the Internet of things (IoT). Above all else, Big Data is the main source of business intelligence for your company. 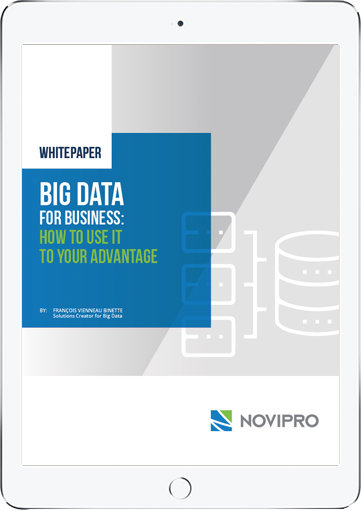 Our paper, Big Data for business: How to use it to your advantage, will help you move forward with your big data projects effectively. Basic methodology for your project. Big Data for business is intended for business unit and IT managers. It was written by François Vienneau Binette, a Big Data Solutions Designer at NOVIPRO. With several years of experience on big data projects in Europe, he is also a certified Apache Hadoop administrator and developer. Our mission is to provide IT solutions that help your company do what you do even better than you thought it could be done. Stay up to date on our news by subscribing to our newsletter. To ensure you are receiving invitations to events and news about our products and services. © NOVIPRO. 2017. ALL RIGHTS RESERVED.